Millie Whipplesmith Plank, woodcut prints. In creating a woodblock print, Millie Whipplesmith Plank becomes involved in a conversation between the wood and her imagery. “ I start with a definite idea of what I want to create but the wood has its own opinion. It takes my tendency for meticulous detail, chuckles, then pushes the work in a different direction.” Whipplesmith Plank’s work is informed by her cattle ranching heritage. It celebrates biodiversity and the preservation of open spaces . Rich colors, simple shapes, and the nostalgia of traditional woodblock prints combines with the energy and texture of spontaneous line. Included in the 2017, 2015, 2014 “Birds in Art” shows at the Leigh Yawkey Museum in Wisconsin, her most recent print was just added to their permanent collection. 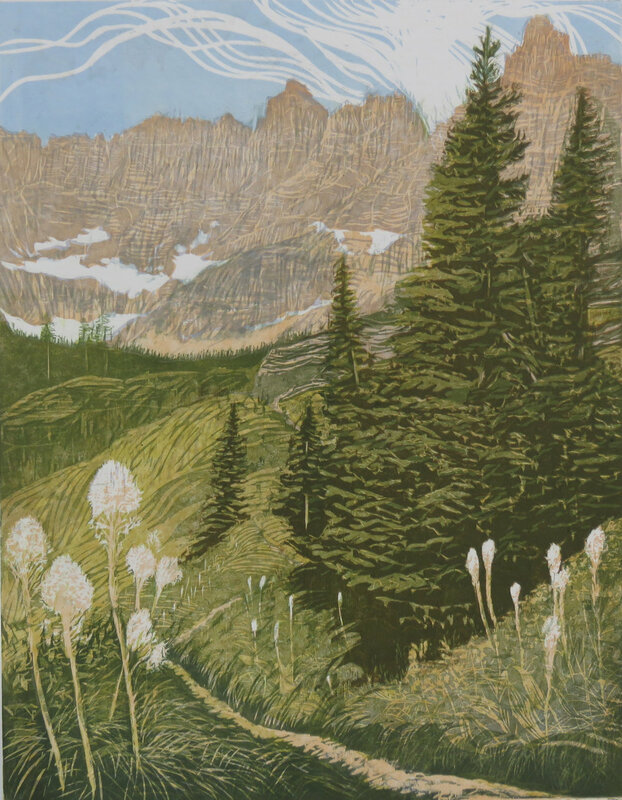 She was accepted into the Society of Animal Artists, 2017 and served as artist in residence at Glacier National Park, 2014, and Lassen Volcanic National Park, 2016. Millie is a board member of the “California Society of Printmakers” and part of the “Rogue Women” of Southern Oregon.